Every team member I spoke with was wonderful. They were friendly, knowledgeable, patient, and always helpful. This was the most relaxing vacation my husband & I have taken since our honeymoon. We were all ready making plans for our next trip while we were there! I love that every staff member we interacted with (on the phone, or in person) was friendly, it made our experience even better. Your guest services team - was awesome. They were very knowledgeable of the area and were very pleasant!! Great place to stay and relax! We will be back! The most beautifully appointed condo we've ever stayed in. The unit layout was well thought out and comfortable. The room is fantastic. Great views and very comfortable. It was beautiful and relaxing! We had a beautiful vacation and the property was well maintained. Everything we needed was very close by: Grocery Stores, and plenty of Restaurants. Overall we had a fantastic time. Loved my vacation! Returning next year! Your staff were very friendly.Seemed as if you were going to stay with family. They were always smiling and ready to help when I needed assistance. It was beautiful and i would stay there again in a heartbeat! We have rented at this property numerous times but this is the first time through your agency. I found everyone and everything about the experience to be wonderful.When booking online, I received an immediate response and all of the correspondence thereafter was efficient, friendly and easily understood. , The young woman at the Counter when checking in was extremely friendly and helpful and seemed happy to be at her job. It was probably the easiest check In and check out I've experienced! Can't say enough about how much we enjoyed our trip and how great and easy the entire rental process was! From Check in to Check out, everything was wonderful. We had no problems at all and found everything we could possibly need and more in our rental. The property is incredible and well maintained. One thing I notice about this property that makes it different than other similar properties is how there is so many homeowners who are so friendly and engaging to all the guests renting other units. Sometimes I've found homeowners at some of the condos we stayed in to be a little less than friendly and a bit resentful of guests. Not so here, in fact several owners in Sunset Harbors not only are friendly but kind and generous offering use of person items etc. It is a really special experience to guests like ourselves to feel so welcomed! I have already referred 2 friends and other family members to this property and they have all stayed and love it as well!! Thanks so much for a great experience and I will keep bragging on you guys! This was the best beach vacation we have ever had. The condo was very large and spacious, very clean and had everything you would need. The ocean view from the balcony was incredible. The staff was friendly and very helpful on arrival. The maintenance staff at the property was very friendly and helpful. 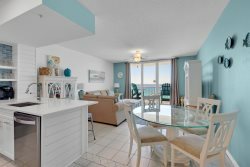 Summerwinds is your best option for a relaxing vacation on the beautiful Gulf coast. It is right on the beach. All you have to do is ride down the elevator.